Full Body « Global Market Insights, Inc.
Analyzing the application scope of soft exoskeleton market: how will the industry dynamics change with the expansion of the healthcare sector? The global soft exoskeleton market is touted to make a big difference in the wearable industry in the coming years, owing to increasing product demand from patients with musculoskeletal and neurological disorders coupled with plentiful advantages of soft suits over bulky metallic suits. Research and development are the cornerstones of this industry, leading players try and guarantee cutting-edge, practical, and quality products for solving consumer problems. Amidst stringent labor safety regulations, there has been an upward momentum in product demand in manufacturing industries, primarily driven by the need to ensure worker safety and enhance efficiency, thereby bolstering soft exoskeleton market size over the future. Workplace injuries are a common scenario in industries which require workers to perform tasks in extreme conditions. With that said, the rising incidences of gait disorders and bone-related injuries are set to fuel market growth in the looming future. For instance, the automotive giant Ford is reportedly introducing 75 upper-body EksoVest exoskeletons across fifteen motor making plants across the globe. The auto behemoth has entered into a collaboration with Ekso Bionics to enhance its employees’ capabilities in the U.S., Mexico, Canada, Romania, Thailand, China, and Brazil. Ford claims that the physical activity of its workers is similar to an individual lifting a container full of flour or watermelons over its head 4,600 times a day. Thus, the introduction of exoskeletons vests would offer passive mechanical support to the wearers while performing overhead tasks, thereby enhancing their efficiency and reducing muscle strain. The military sector has always been actively looking for solutions to empower armed personnel in terms of safety and efficiency. Although military personnel are tough and strong, the nature of their work makes them highly vulnerable to muscle sprains and spasms. A recent development by a multidisciplinary team of researchers from Harvard SEAS and Wyss Institute of Harvard in fact, has put the military sector in a tizzy. The researchers have fabricated a pioneering soft multi-joint exoskeleton ideal for soldiers and emergency labors. The soft exosuit embraces an advanced automatic tuning technique that decreases fatigue and injury during strenuous jobs and allows users to stay active longer. The device has been designed to boost mobility by applying mechanical forces to vital joints of the body. The mechanical forces are conducted via cables that run through the exosuit’s components to hip joints and ankle to add power to leg movements. Moreover, the exosuit can help elderly or mobility impaired individuals lead more active lives. Thus, it is overt that product innovation initiatives for the betterment of defense workers will influence the commercialization graph of the soft exoskeleton market over the future. Soft exoskeleton industry size from healthcare applications is anticipated to grow at a rapid rate attributed to the burgeoning adoption of exosuits by patients with physical disabilities such as Parkinson’s disease and multiple sclerosis. The rise in the number of hospitals, clinics, and medical centers offering rehabilitation treatment to paralytic patients is projected to impel market penetration in the coming years. In addition to this, the ability of soft exoskeleton to provide relief from spine injuries, traumatic brain injuries, and strokes would further advance market share. Lately, ReWalk Robotics Ltd., the leading producer of exoskeleton solutions, has reportedly premiered a soft suit exoskeleton prototype, known as Restore, aimed at helping stroke survivors. The soft exoskeleton looks a lot similar to what construction workers wear for safety rather than a wearable robotic system. It contains a waist band fixed with a battery and motor, flexible cables that convey power from the motor to the ankles, shoe sensors, and leg braces. The anticipated release of a marketable Restore soft suit is scheduled for 2018. The expansion of the healthcare industry and the numerous developments it is characterized by will thus prove to expedite this business space in the coming years. The rising implementation of full body soft exoskeletons in the industrial sector to enhance workers’ productivity, decrease stress and fatigue would significantly bolster product demand in the years forward. Unlike conventional suits, full-body wearable soft exosuits provide varied flexibilities because of the absence of an exterior metal frame. Additionally, optimum service and support offered by manufacturers to businesses will extend incredible growth prospects for the soft exoskeleton market. Reportedly, researchers at the Wyss Institute have recently developed cutting-edge soft exosuits that are aimed at mitigating injury risk and improving worker productivity during heavy lifting and reaching jobs. The soft exosuit technology is a textile-based system, that looks and feels similar to clothing but is intended to offload pressure from the back muscles while performing physically demanding tasks. Based on the aforementioned factors, it is rather apparent that soft exoskeleton technology looks to revolutionize the physical potential of the mobility-disabled, manufacturing workers, soldiers, and elderly by providing additional strength and stability to help appease exhaustion, pressure, and injuries. The lucrative advantages of the posture and motion support provided by these products across a vast application landscape would significantly amplify soft exoskeleton market size in the imminent future. This entry was posted in Electronics and Media and tagged Full Body, Global Soft Exoskeleton Market, Healthcare, Industrial, Lower Body, Military, Soft Exoskeleton Market, Soft Exoskeleton Market Analysis, Soft Exoskeleton Market Forecast, Soft Exoskeleton Market Size, Upper Body. ReWalk Robotics’ soft exoskeleton launch a while back apparently took exoskeleton market by storm. The product has been exclusively designed by the USA-based exoskeleton industry player to help in the rehabilitation of patients suffering from lower leg limb disability due to strokes. The device would also help patients diagnosed with Parkinson’s and multiple sclerosis to heal faster and regain their balance. 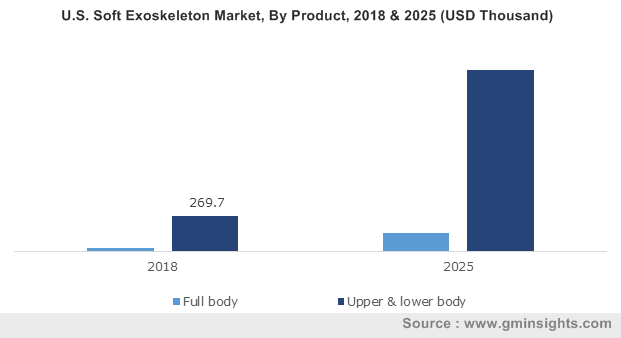 Characterized by technological innovations, exoskeleton market strives to bring about a transformation in rehabilitation devices for consumer comfort. In yet another breakthrough, Lowe’s companies Incorporation, a key player across the retail industry, and Virginia Tech, an educational institute & university based in the U.S., have built a soft & light exosuit to help the employees working in Lowe’s retail stores to easily lift and move heavy products across the store. In the first quarter of 2017, exoskeleton market witnessed one of the most potentially lucrative deals, with Parker Hannifin Corporation, a key manufacturer of motion & control technologies, introducing a therapy software suite for its Indego exoskeleton across Europe. The new suite has made Indego a unique exoskeleton for non-trajectory based gait training & treatment. Furthermore, Lockheed Martin, a U.S. based aerospace, defense, and security firm, has also launched a computer-regulated exoskeleton device referred as FORTIS Knee Stress Release gear that helps soldiers counter stress on their legs & lower backs. It also improves their load carrying capacity and movement, preventing injuries and exhaustion. The advent of consecutive innovations will encourage other business players to follow suit, thereby contributing toward augmenting the overall exoskeleton industry size. Recently, scientists have unveiled a robotic exoskeleton that helps in restoring balance through accurate gait correction, thus avoid dangerous falls. The new device is also expected to help the elderly, amputees, and disabled people to maintain balance and steadiness. The WHO claims that potential falls resulting in fatal injuries are one of major causes of death. This is evident from the estimates – falls result in the death of over 640,000 people per year, with nearly 37.3 million severe falls requiring medical treatment. Exoskeletons find wide applications across healthcare, industrial, and military sectors. The introduction of new technologies across the healthcare sector to ensure the safety coupled with the allocation of funds for healthcare will spur the product penetration. Healthcare applications are expected to emerge as the dominant application segment by 2026, owing to the rising demand for rehabilitation spurred by disorders such as Parkinson’s disease, spinal cord injuries, and other gait disorders. Not to mention, exoskeletons offer numerous benefits to healthcare providers, reducing the burden that therapists endure during training and therapy. Exoskeletons are rapidly gaining momentum across myriad geographies. The huge presence of exosuit manufacturers and escalated product demand across military & healthcare sectors are anticipated to stimulate APAC exoskeleton industry outlook. This regional market, as per estimates, is expected to record the highest CAGR over 2019-2026. Mounting awareness about the beneficial use of industrial robotics in manufacturing activities and the rise in the production of wearable robots across the defense sector are predicted to be the key factors driving APAC exoskeleton industry, with China and South Korea forecast to be the major revenue pockets. Additionally, countries such as Japan, and China have also been undertaking extensive R&D initiatives that would help impel exoskeleton industry. For example, in the year 2018, Norinco, a state-owned manufacturer in China, brought forth military exosuits in order to aid the weight carrying capacity of armed forces. Major corporations such as ReWalk Robotics, Lockheed Martin, REX Bionics, Panasonic Corporation, and Cyberdyne Incorporation have made remarkable contributions toward augmenting exoskeleton market size in recent years. 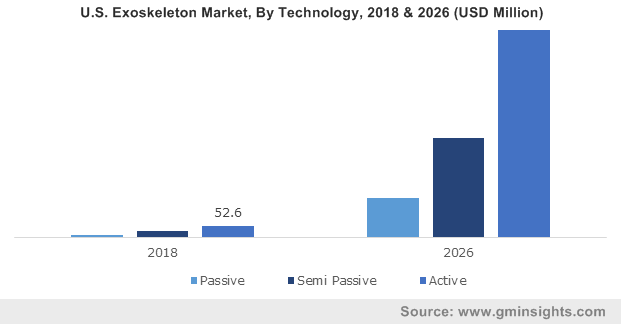 The recent breakthroughs witnessed across the business landscape indeed validate the claims put forward by market analysts, who state that exoskeleton industry size would be worth more than USD 3.5 billion by 2026. This entry was posted in Electronics and Media and tagged Exoskeleton Companies, Exoskeleton Industry, Exoskeleton Market, Exoskeleton Market Forecast, Exoskeleton Market Leaders, Exoskeleton Market Size, Full Body, Industrial Exoskeleton Market, Lower Body, Medical Exoskeleton Market, Military Exoskeleton Market, Mobile, Stationary, Upper Body.